I can’t say enough about author Grace Lin. She is a spectacular story teller. 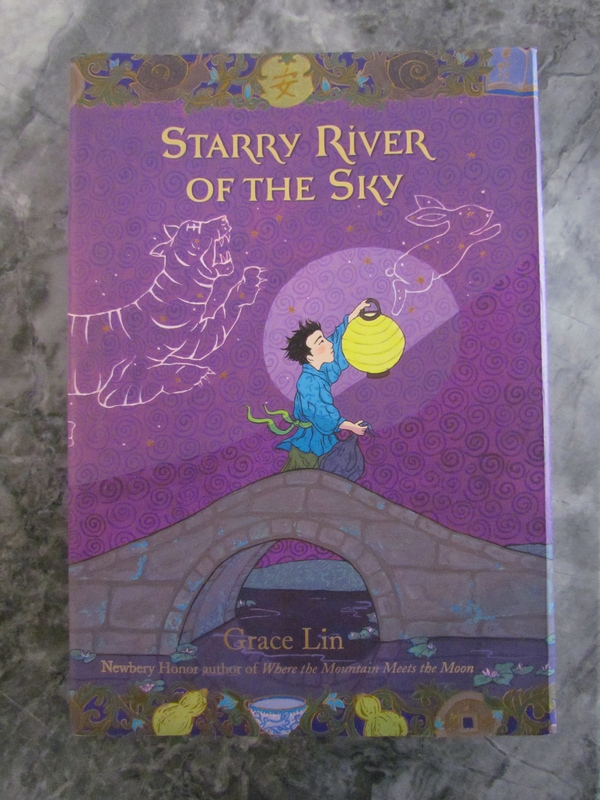 My children and I have so enjoyed her books, and this latest addition to our home library, Starry River of the Sky published by Little, Brown & Co., is certainly no exception. A companion book to Newbery Medal winner Where the Mountain Meets the Moon, Lin’s Starry River weaves familiar Chinese folklore into the story of a young boy named Rendi who is discovered by an small village innkeeper while stowing away in a merchant’s cart. Rendi is a runaway – angry, skeptical, judgmental and rude. He finds himself stuck in a small, poor village that is not only sweltering hot and dry as a bone, but is also missing the moon. The strange absence of light in the night sky only frustrates him while he begrudgingly works as a chore boy in the village inn. And adding to Rendi’s list of disappointments in this pitstop along his escape from home, is how incredibly unimpressed he is with the townspeople – that is until a mysterious and breathtaking woman checks into the inn and entertains them with exciting stories and charming conversation. This book, filled with laughter, frustration, mystery and suspense, is of Rendi’s transformation into a compassionate and courageous boy – getting there with a little help from his friends. Is there power in forgiveness? How does it make you feel to forgive someone? How does it make the other person feel? In Buddhism, we cultivate the practice of “The Four Immeasurables”, loving kindness (benevolence), compassion, empathetic joy and equanimity (composure). Engaging in these mental states has the power to cause the practitioner to be reborn into god or goddess. Can you think of an example in SROTS? In the book “Buddha”, Deepak Chopra writes, “The fire of passion burns out eventually. Then you dig through the ashes and discover a gem. You pick it up; you look at it with disbelief. The gem was inside you all the time. It is yours to keep forever. It is buddha.” Can you think of how this could apply to Rendi? To the White Tiger? Do you think there is a gem hidden deep inside of Magistrate Tiger? Do you think there is a gem inside of you? What about inside of someone whom you think is mean or rude? Enjoy the read… and the special time with your children!